To test if a certain hypothesis is likely to be true we can take advantage of the Apache commons math inference package. Considering the tests included in the package is a good opportunity to learn more about statistics and probability theory. //Two sided = Represents a right-sided test. H0: p ≤ p0, H1: p > p0. The significance level is lower that the expected value alpha; it means that we can discard the test. August 30, 2017 September 10, 2017 lauraliparuloComments are off for this post. Although some statistical analysis can be performed with simple Java 8 code (thanks to lambda functions and Stream API), a lot more with less lines of code can be achieved with libraries Google Guava or Apache Commons Mathematics Library. I am a big fan of the Apache Foundation, so I will discard Google guava for now. The commons library offers a couple options for each statistical function. or use the classes Mean, Median, etc. August 28, 2017 August 30, 2017 lauraliparuloComments are off for this post. 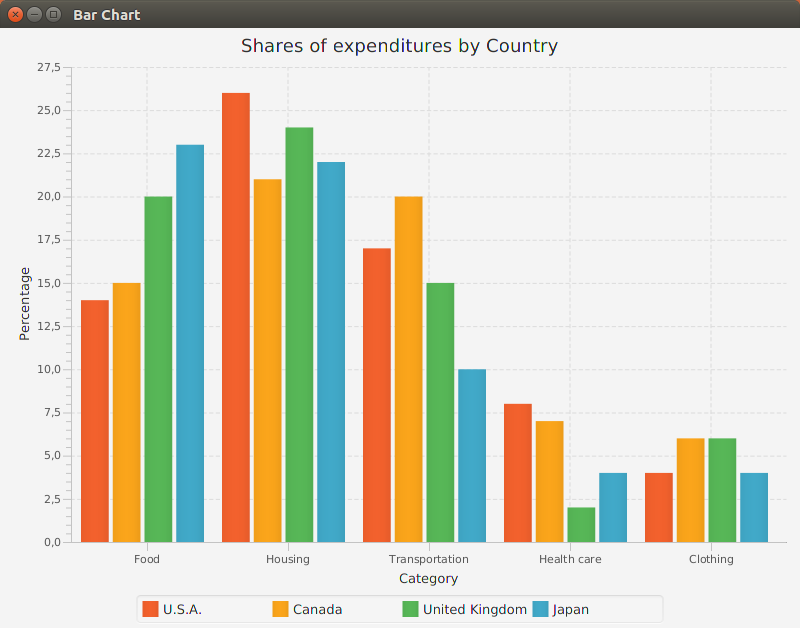 A nice java library called opencsv allows you to import the csv file content and make charts out of it. August 26, 2017 August 27, 2017 lauraliparuloComments are off for this post. This year some books about using Java for Data science have been released and I am very happy about it!!! It doesn´t have to be Python at any cost. 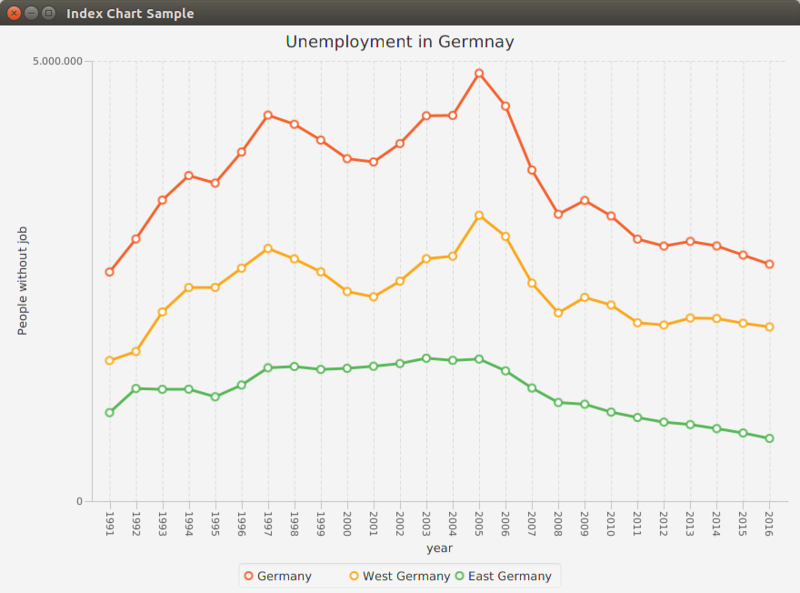 Some basic visualization can be achieved with some FX classes, that can be found in the “javafx.scene.chart” package. August 25, 2017 August 27, 2017 lauraliparuloComments are off for this post. #the standard deviation is also rounded to two decimals only. February 22, 2017 February 22, 2017 lauraliparuloComments are off for this post. Python scripting with Linux: which shebang? It must be added on top of the file. In the previous post I told you about the old fashioned way to handle files in java. In this article we will focus on the new API. The File class is no longer used. We will use the “Path” class instead. The “createDirectories” method created the whole file system structure (the nested directories). With NIO.2 copying or deleting a file or directory have become a matter of one line of code, thanks to the very straightforward methods “copy”, “delete”, etc. Many things can be achieved with the utility classes Files and Paths. February 5, 2017 February 5, 2017 lauraliparuloComments are off for this post. Let´s take a look a the classic IO file handling in java. First let´s start with the “File” class. The File class is not used to read or write data. It´s used to create or delete files and directories, for searching and working with paths. So it´s not used for the files or directories content. The createNewFile method returns “false” if the file already exists. The FileReader method “read” delivers the amount of character read. Notice that after writing the text into the file, you need to call the method “flush”. It´s necessary to call it to make sure that the whole data flows into the file before closing the writer. So far so good. But this simple way shown above is not the most elegant solution out there, because we have been using an array (that has a fixed size)! Notice that buffered reader also has a method called “readLine”, that you wouldn´t get with a simple File reader. Once you close a writer it cannot be reopened again. You get an exception if you use it after closing it! For testing and debugging purposes you can enable the assertions evaluation with the VM parameter “-ea” ( or “-enableassertions” if you prefer the whole thing). The assertions remain in the code and are just ignored at runtime if you don´t enable them. You can think of them as an aid in case of need. Exception in thread "main" java.lang.AssertionError: the name Anna is not Laura! Since Java 1.4 “assert” has become a keyword. Assertions can be disabled with the VM option “-da” or “-disableassertions”. Although the assertions are disabled by default, the manual disabling might make sense if you don´t want to enable the assertions for all the classes. So entering VM parameters like “-ea:” or “-ea:” allow you to select which assertions to evaluate. February 2, 2017 lauraliparuloComments are off for this post. Running “apt-get update” ubuntu complains about missings ppa keys. In my case I was trying to install Libre Office and the missing key was 83FBA1751378B444. and the I could finally run “apt-get update”. October 4, 2015 January 1, 2017 lauraliparuloComments are off for this post.